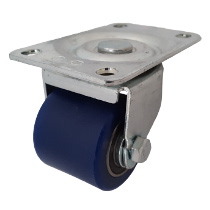 This 2-inch solid polyurethane log wheel design is a good choice for lighter duty, low profile requirements. The solid polyurethane wheel offers added floor protection. It features a 2" diameter blue polyurethane wheel. It's 2.8438" tall and has a 300 lb load capacity and a 2" swivel radius. Applications include computer equipment, semiconductor equipment, larger printers, and diagnostic equipment. RoHS compliant. Fastening Description Top Plate - 2-9/16" x 3-5/8"
Bolt Hole Dimensions 1-3/4" x 2-15/16"